The worst 24 seconds of this young boy's life. It’s probably the worst 24 seconds of this young boy’s life. 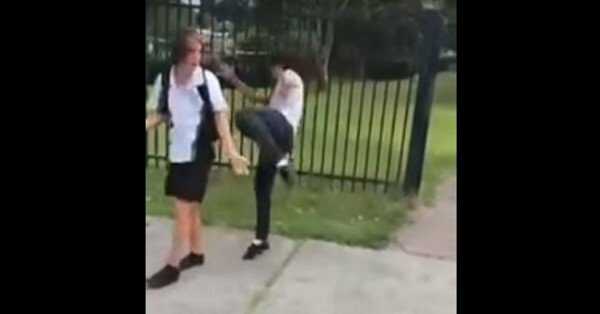 A sickening video has come to light showing a school boy being viciously attacked outside the gates of a school. It shows the victim being repeatedly punched and kicked as he pleads to his attacker, “What did I do?”. The offender pushes him and continues to assault him at the front of the school while multiple witnesses watch on, one of them steadily filming it and coldly posting it on YouTube. The first strike is a savage slap across the face. When the victim stumbles away the bully goes after him and continues the attack, taunting him by repeating, “Really?”. Several voices can be heard in the background. The video was posted on YouTube on a channel under the name of Mike Jay. Article continues after this video. Just after the victim rights himself and turns his head to check on the attacker’s whereabouts, he receives a kick to the head, the sickening sound followed by groans. He is then pushed against the school fence by the relentless bully and while he clings to the fence, asking once more, “What did I do?” cops a kick to the back. It is only after the offender walks away that someone steps up to the victim to comfort him. By this stage the victim is slumped against the fence, his head in his hands. When the victim stumbles away the bully goes after him and continues the attack, taunting him by repeating, “Really?”. As the thug walks away he can be heard saying “I could have killed you, you Oz”. Not once does the victim attempt to defend himself. 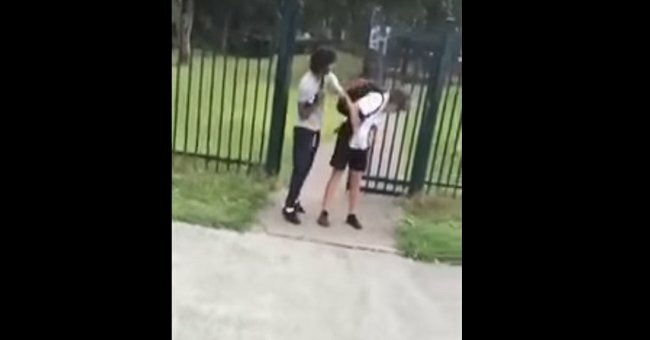 It’s hard to know what to say about this video except that it is one of the most sickening incidents of bullying we have ever seen. How can someone so young be so vicious? Why was it filmed? Why didn’t the witnesses intervene immediately? We are constantly confronted with evidence of violence in Australian schools. Just as the victim begins to turn his head towards his bully, he receives a kick to the head. A Senior Constable at Dandenong Police Station confirmed the video was being investigated after they were contacted by several concerned members of the public. 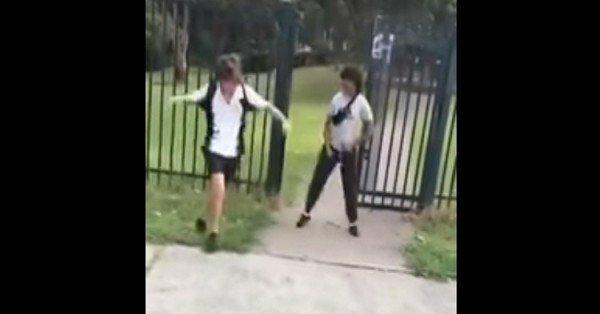 The video was originally connected to a Dandenong school however their investigation revealed that the video is almost a year old – although it was only posted to YouTube last week – and that the incident took place at a school in Newcastle. He said, “the matter has been dealt with”, however gave no further details. In situations like this, the Senior Constable said they are taken just as seriously as other incidents of violent assault. The course of action is to identify the victim, offender, witnesses and correct location of the incident. The victim would then be questioned and even if they didn’t wish to pursue the matter, it’s up to the police whether or not the offender is charged. It is then left to the courts to decide how it will ultimately be handled. If you are being bullied or suspect someone is being bullied, please contact Kid’s Helpline on 1800 55 1800.